TEHRAN, Iran, January 23, 2017 (ENS) – Iran’s first electric car and two electric motorbikes manufactured by Iranian companies were unveiled in the presence of President Hassan Rouhani last week at the presidential complex in Tehran. 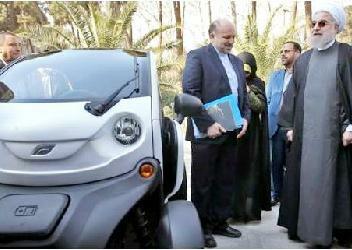 The “Financial Tribune,” an Iranian publication, reports that President Rouhani drove the Iran-produced two-seater micro-electric vehicle Yooz on January 18 to mark the occasion of National Clean Air Day. The Yooz was designed and developed by engineers at Parax Company, affiliated to Islamic Azad University’s Qazvin branch. The company specializes in designing small electric cars. The battery-powered 400 kg EV is just 120 centimeters wide and two meters long, perfect for parking in crowded urban areas. Charged for three hours, the Yooz can cruise for 200 kilometers at 80 k/h. The car’s maximum speed is 100 k/h. The Yooz is not currently for sale in the open market. At the same event an electric motorcycle called Avita was also unveiled. It was built at the Shahid Rezaei Research Center affiliated to Sharif University of Technology. An electric motorcycle manufactured by the knowledge-based company Bana Sharif was also displayed at the event. Bana Sharif is a joint venture set up by Sharif University of technology and Jahanro Company which manufactures motor bikes. The company manufactures electric cars, hybrid cars and electric motorcycles. President Rouhani applauded the work of local manufacturers in the green auto sector, while urging improvement in the quality and safety of Iran’s automobiles. On the sidelines of a cabinet meeting, the Yooz was also taken for a spin by Intelligence Minister Mahmoud Alavi-Tabar. Also present were first Vice President Es’haq Jahangiri, Vice President for science and technology Sorena Sattari and Massoumeh Ebtekar, who heads the Department of Environment. The Rouhani administration has been promoting the use of hybrids and EVs, but some experts and observers say the infrastructure for the move to eco-friendly transportation is not yet in place. In an interview with the “Financial Tribune” last September, Ebtekar said that research and development is underway in Iran’s auto industry and extensive research is being done in universities. She said Iran has a large industry producing lithium-ion batteries, a key component of electric cars and motorcycles. The Rouhani administration has removed import tariffs on hybrid cars as a way to motivate local carmakers to produce alternative fuel vehicles. Owners of petrol/electric hybrid vehicles were recently exempted from paying extra for entering restricted traffic zones in Iran’s big cities. However, they must register their cars as hybrids, and this excludes CNG/gasoline hybrids. vehicles. The government is also encouraging taxi owners to exchange their dilapidated petrol-powered cars for new electric-gasoline hybrids. Aware of the danger of air pollution that grips the capital for almost the entire year, Tehran Municipality is moving to replace the buses with dual-fuel and electric-only buses.